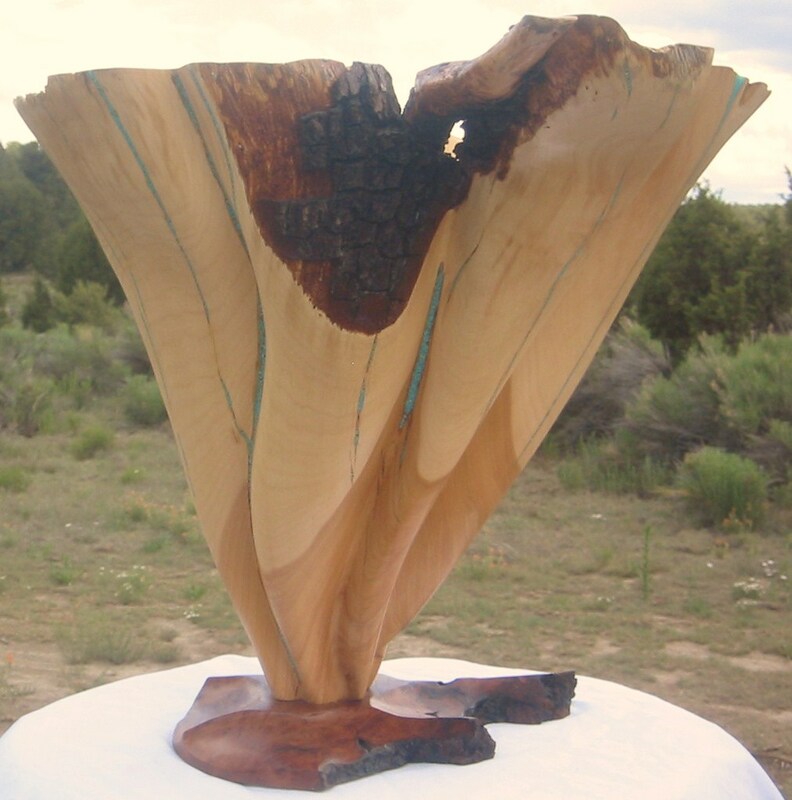 This gorgeous piece was created from “Forest Reclaimed” Juniper wood with a cherry burl base. 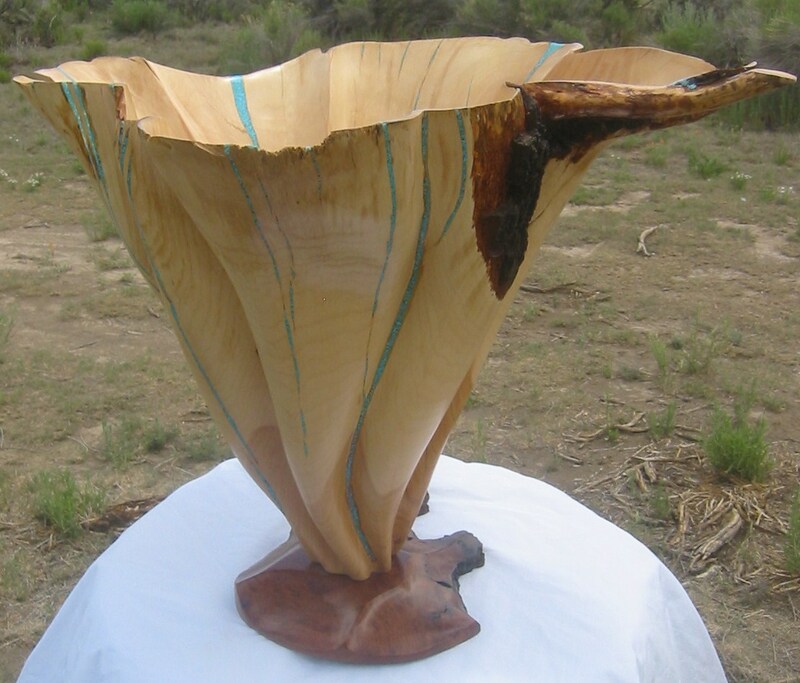 It stands approximately 36″ T x 30″ Diameter. 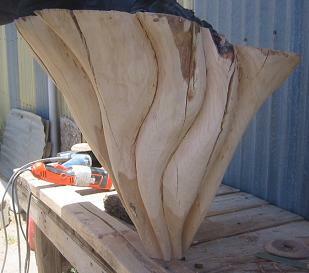 It consists of folds and bends that sweep and curve up the piece both inside and outside. Some bark and a limb were were left intact for that natural element. This piece really stands out and makes a statement. These are pictures showing how a funnel shaped vessel is created. 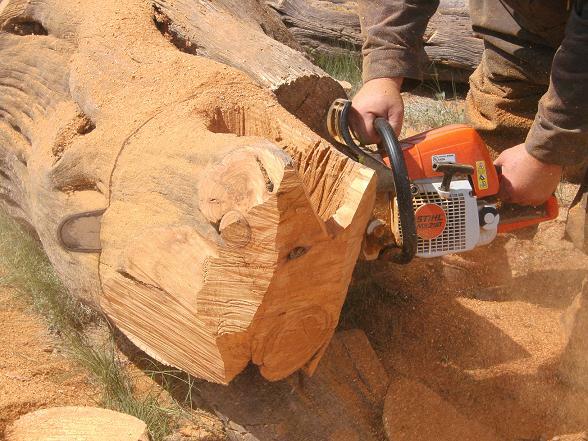 The chainsaw is used to cut up the right log and then start the funnel shape. 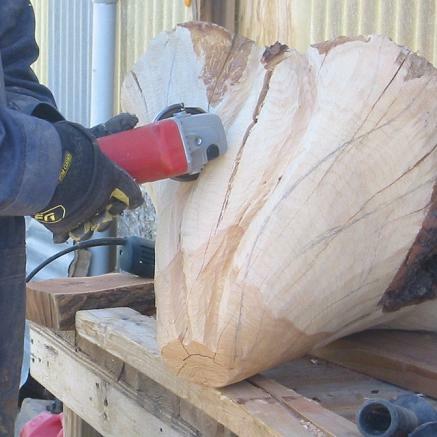 Here Scott is using the chainsaw to carve out the bulk of the wood on the inside of the vessel. Being careful to not go through. 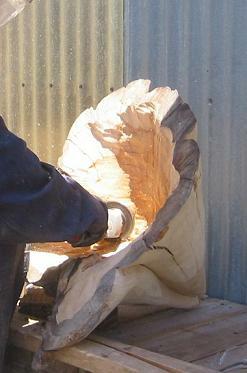 A grinder is now being used to carve out more wood and start the shaping. 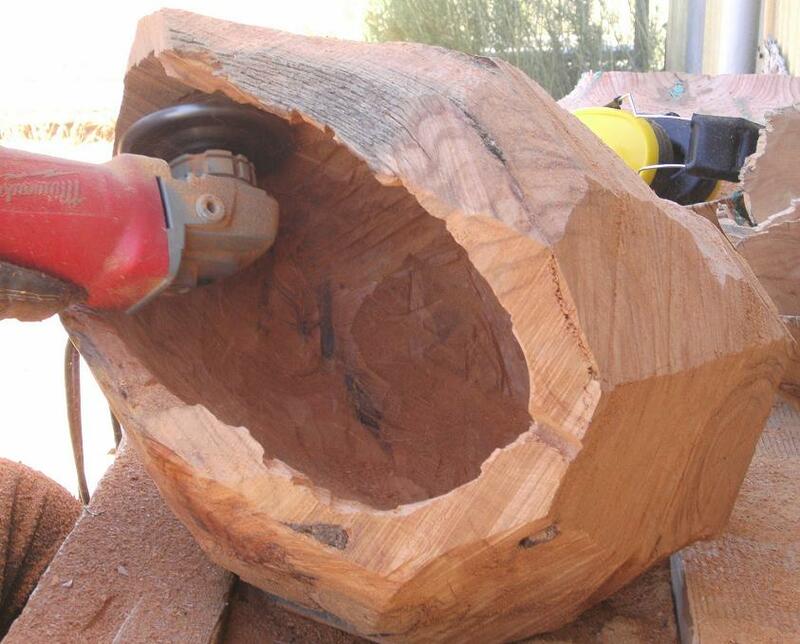 The spirals on the vessel are taking shape and you can see how the piece will look once complete. 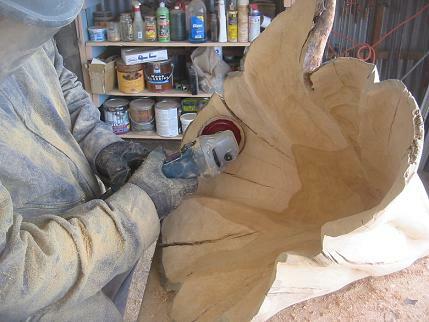 Here the inside of the vessel is being shaped with a grinder. Bends and folds are created with finess being careful to not go through. These bends and folds narrow down to the bottom. 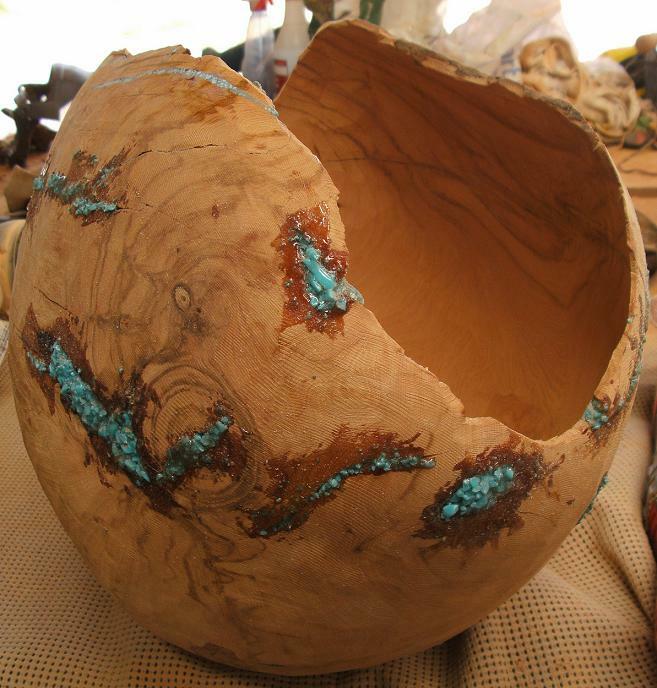 Once the piece is done shaping and smoothed out, turquoise is inlayed into the natural cracks and voids. Then the piece is painstakingly sanded to a smooth finish and finally a spray finish is applied to ensure that all areas are covered. And now it is ready for someones home or office. This is a medium shaped canyon vessel. We call them Canyon vessels because their shape resembles that of a canyon. These vessels can be straight forward with a smooth outside and inside (like pictured) or we can add folds, bends, crevices and waves. Normally we add turquoise to these pieces, but we can add other gems and stones as desired. Their sizes can range from approximately 12″ tall and long at the smallest to as large a log as we can find (like “Grand Canyon” found on our website). 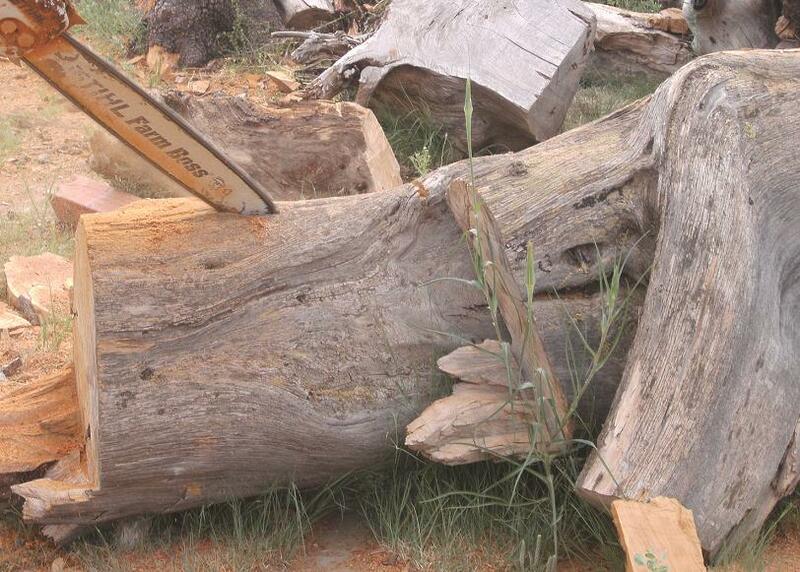 Normally we use “Forest Reclaimed” Juniper since we can find this wood locally. 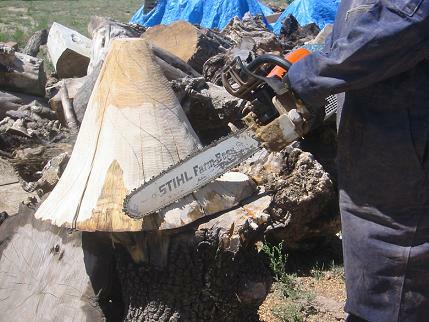 However, when we can get ahold of other woods such as mesquite, walnut, cherry etc. 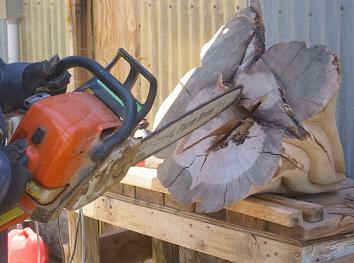 we love to work with the different woods. The prices on these Canyon Vessels varies on the size and wood and if certaint gems or stones are used. 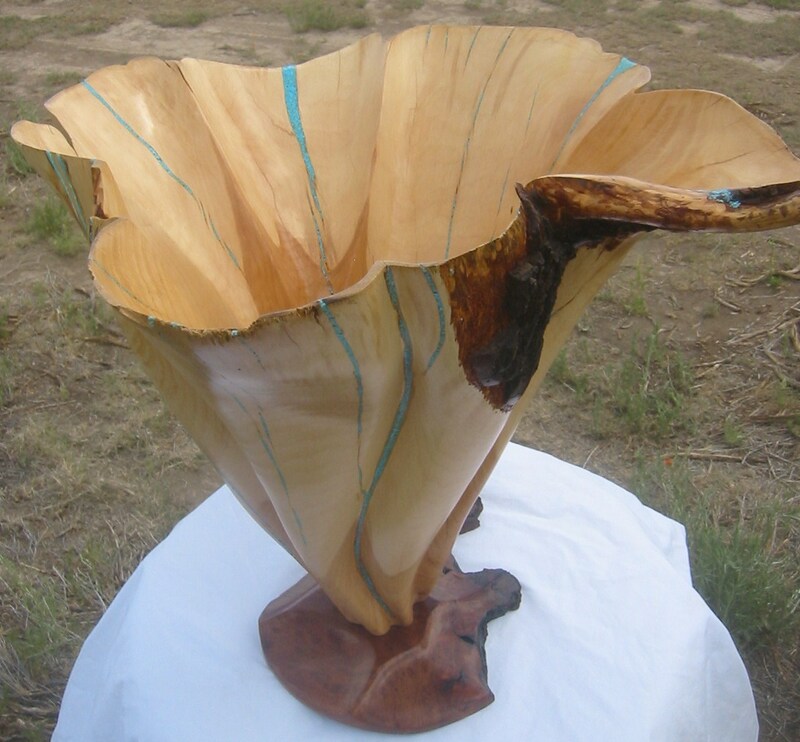 The commissioned vessel pictured was approximately 18″ T x 18″ L x 4″W and would sale for $1200.00 out of juniper with turquoise. You are currently browsing the Shangrilawoodworks's Blog blog archives for August, 2010.